Quiltville's Quips & Snips!! : On Marking Lines, Piecing Blocks, and Making Friends! On Marking Lines, Piecing Blocks, and Making Friends! I’m heading home from Illinois this morning after spending several days with the Illini County Stitchers in Champaign. I’m not the only one traveling home ---we had several ladies come from far away places this week. They road-tripped from Missouri, Arkansas, Indiana, Minnesota and Wisconsin and from all over the state of Illinois. My wishes for a safe travel trip back home for each of them! It really did feel like a “Retreat Week” here and I loved the stories of where they stopped and shop-hopped all the way here, and where folks are PLANNING to stop on their way back home, going the OTHER way. Have you heard of the Quilt Shop Row by Row sweeping the nation? Many quilt shops all over the USA are participating and you can pick up your free row pattern and collect them with others. It sounds like fun! 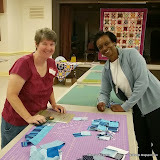 Yesterday’s Sisters Choice quilt class is a favorite. We learn an untraditional way to piece a traditional 9-patch center, and we share hints and helps when doing diagonal sew and flip methods. Basic things we use all the time in quilt making, but often need just a bit of fine tuning and streamlining to make pieces fit together just *that much better*. When marking on dark fabrics we are always on the look out for a tool that marks an easy to see line that stays in place and doesn’t brush away ---we want the price to be easy on the budget, and we want these items easy to find locally. I’m going to share a couple of them with you. We did a test on the Uniball Signo silver pen, and the silver gelly roll pen, both of which can be found at both office and art supply stores. Lines drawn with the gelly roll pen. Easily seen! Yes, I’m drawing two lines! Click HERE for my article called Bonus Triangle Bonanza and start saving YOUR bonus units in an already usable size! Lines drawn with Uniball Signo pen. Both worked well, but I think the uniball rolled easier onto the fabric. I’d use EITHER in a pinch and plan to locate some of these when I reach home. I do not know if both are permanent. I saw no bleeding through the fabric. I do not know what happens when these are washed, but as long as they stay on the back side of the fabric, I’m good with it. If you have experience with either of these marking tools, can you leave your thoughts in the comments section below? I’m thinking of how nice this will be to mark the remaining 2’ black squares for our current 2014 Leader & Ender Lozenges challenge! I hope you enjoy the slide show of yesterday’s class sewing away like crazy. Click the image below if you can’t view the slide show on your mobile device. You’ll be taken to the photo album for viewing. I’ll be home by dinner time tonight! Thanks for the tip on the silver marking pens. Must add this to my list when I hit Staples next trip (no office supply in my home town). Presently I use a sliver of soap for marking, it stays on pretty good and will wash out when the quilt is finished. Hi, Bonnie! I'm glad you brought this subject up. I have a white (not metallic) jelly pen that I use to mark the back of fabric for special cuts, etc. And with marking the back, I've never checked to see if it ran or washed away. I also use a chalk pen- the kind with chalk powder in it, that works well on some things, but it's not permanent. And I have white pencils that only work on certain fabrics. I go out of my way searching for pens that will mark on dark fabric, including a White-Out pen, which only works sometimes. Let us know if you find anything new! I usually use a white or yellow colored pencil. I've also been known to follow my Mom's way and used a thin sliver of soap to mark dark fabrics. I will have to try this method, though! I learned a very interesting way to "NOT MARK" and still sew from corner to corner. Emery cloth (hardware store) strips can be placed next to where you want the line, and just sew along. I think an emery board (for fingernails) would work as well. I bought a sheet of emery cloth for $1.79, and got several strips, long strips.... Enjoy! The Row by Row has it's own website and facebook page where you can get information, participating shop, maps, etc. And get a look at the designs for rows. Lasts thru August, lots of fun and prizes to win. I have used silver gel/roller pens for several years to mark dark fabrics for needleturn applique. I mark on the right side of the fabric because I will be turning the fabric under as I go. I use a regular mechanical pencil for light fabrics. So far no problems with bleeding ink using the silver pens. Colored pencils don't work for me. The lines they make are too fat and the pencils have to be sharpened every five seconds which is another problem. The leads break a lot and you waste much of the pencil when they do. My eyes aren't as young as they used to be and I need to be able to see the line for successful applique. The silver pens meet this criteria. I know you don't do much applique, but I have used the silver pens in the way you show above with good results. I haven't tried the silver Unibal. I have Unibal white ink and it is great for dark fabrics. I think the silver will be more useful, as it will show up on light and dark fabric. I cannot say anything about the Uniball, but the JellRoll pens are Archival, acid free and permanent, so you wont get any bleeding or weakening of the fibers over time. I have white, in the fine line and use it a lot for marking on dark fabrics. Also, the white, gold and silver can be used for signing autograph blocks on dark fabrics, and makining labels too. I haven't tried pen to mark, but will have to give it trial. I'm playing with the Row by Row here in WA state. Don't get to travel very far, but what the heck. We have some pretty rows. I have not seen anyone else mention this, but has anyone else been having trouble viewing the albums lately? This post and a post about 2 prior--when I attempt to view the album I get Google's internal error page. AND on those pages, the slide show is not present at all. There is a big white void where it would be on the page, but nothing is there, no outline or anything else. I have checked my own settings, removed any and all blockers with no change. I miss the slideshows! I have a Clover white marking pen, that gives a fine, clean white line - a few moments after you draw it. Weird that it shows up late, but it works for me. I also want to wish Bonnie and everyone going with her "Bon Voyage". Just a few days to go ! Learning about new marking methods is super in my book. I'll definitely be on the lookout for those pens. I have used slivers of soap and chalk pencils in the past for dark fabrics. What really causes a problem is those blue and green fabrics that aren't really light or dark. They're just dark enough that a mechanical pencil doesn't show up and light enough that the soap doesn't really show up. I think the gel pen or the uniball one will work for those perfectly. As far as the slideshow not showing up, I can view mine but today when I viewed it, it stopped and wouldn't go to the end. I ended up having to view the album to see the rest of the slides. It might be me, but thought I would mention it if others are having the same problem. Today has been the only time I have had problems. Bonnie, I just love seeing the color and fabric combinations other use in their quilts, especially with inner and outer borders. This keeps me from sticking to the same brown or blue for everything. Variety is the spice of life and you keep me hopping! So do your students! In response to Debra's comments, the silver pens are superior to other non-metallic marking pens because even on a light colored fabric you can usually make out the marks because the light will catch on the metallic mark to help you see it. Valerie, sign completely out of all google accounts and, relog in. Amazon has one Uniball Signo silver pen left because I just bought one. Free shipping if you have prime. Bonnie, thanks for the suggestion, but it didn't work. I cannot log out of google on my Android device. I've looked online for how to do that and all answers involve losing all your data. And online, other than logging out of Google+ I'm not sure where else to go. Guess I'd better do more research. But thank you. It's something that just happened this week and it apparently affects my ability to view all slideshows here, cuz I checked back quite a few weeks worth. DARN these modern conveniences. The white Uniball pen is a Great pen that originated in the Scrapbookking world. You can usually find them in Michaels, not sure about Hobby Lobby, or if you have a Stampin Up representative, she can order them for you. A card maker on Utube did a comparison of white pens and Uniball won, hands down. I have also heard that the silver works well for applique. Just my two cents.